Wetteren, 1979. xix, 326 pages of text, 41 excellent plates. Green cloth, new copy. Contains 30 very relevant articles (most of them in English) by prominent numismatists specializing in the Greek series such as H. Bloesch, C. Boehringer, H.A. Cahn, W.E. Metcalf, G. Le Rider, and many more. Among the more useful and important articles included here are "The Late Cistophori of Apamaea" (F.S. Kleiner), "The Portrait Coinage of Ptolemy V" (O. M�rkholm), "Winged Carians" (H.A. Troxell), "Der Tissaphernes-Fund" (S. Hurter), and "Tetradrachms From Babylon" (N.M. Waggoner). Cahn, Herbert A.� "Olynthus" and Syracuse. Boehringer, Christof - Zu Finanzpolitik und M�nzpragung des Dionysios von Syrakus. Hackens, Tony - � propos de la couronne fleurie de la d�esse H�ra. Buttrey, T. V. - The Athenian currency law of 375/4 B.C. Jones, Frances Follin - Fifteen turtles and tortoises. Holloway, R. Ross - The bronze coinage of Agathocles / R. Ross Holloway. Harrison, Evelyn B. - The iconography of the eponymous heroes on the Parthenon and in the Agora. Hurter, Silvia -� Der Tissaphernes-Fund. Jenkins, G. Kenneth. - A Tarentine footnote. Meshorer, Yaakov. - Sepphoris and Rome. Nicolet-Pierre , Helene - Les monnaies des deux derniers satrapes d'Egypte avant la conquete d'Alexandre. Kleiner, Fred S. - The late Cistophori of Apameia. Le Rider, Georges.� Un tetradrachme hellenistique de Cnide. Metcalf, William E. - New and noteworthy from Roman Alexandria. Pescennius Niger-Diadumenian. Price, Martin Jessop. - On attributing Alexanders - some cautionary tales. Kraay, Colin M. - The Isparta hoard. Mitrea, Bucur. - Un tetradrachme Athenien du nouveau style decouvert en Dacie. Morkholm, Otto. - The portrait coinage of Ptolemy V : the main series. Naster, Paul. - Empreintes de sceaux hellenistiques de Warka et monnaies seleucides. Oeconomides, Mando Caramessini. - The 1970 Myrina hoard of Aeginetan staters. Kroll, John H.� A chronology of early Athenian bronze coinage, ca. 350-250 B.C. Zervos, Orestes H. - Near Eastern elements in the tetradrachms of Alexander the Great : the eastern mints. Thompson, Dorothy Burr. - A numismatic comentary on the Ptolemaic cult oinochoai. Thompson, Margaret. - A bibliography of the works of Margaret Thompson. Waggoner, Nancy M. - Tetradrachms from Babylon. Troxell, Hyla A. - Winged carians. 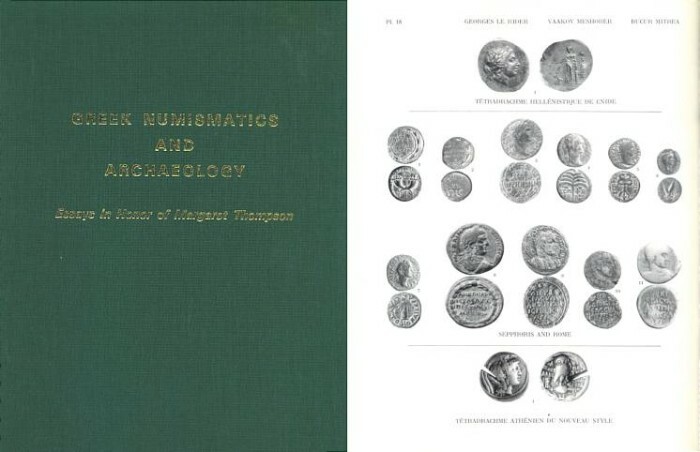 Weinberg, Gladys Davidson.� On numismatic evidence. Westermark, Ulla. Overstrikes of Taras on didrachms of Acragas.